Formed in 1979 Finland's own Riff Raff should have been able to stake their claim at the top of heavy metal's food chain. How do you go from having one of the best NWOBHM influenced albums of all time to almost utter obscurity? Should we blame it on their location? Is it because Robot Stud is too much blue collar hard rock and not enough dungeons and dragons heavy metal for today's collectors? I've never been able to figure out why Robot Stud isn't more well known. Imagine a vocalist who comes off like a cross between Udo Dirkshneider and Bon Scott. I Can't help but close my eyes when I listen to Riff Raff and imagine Kari "Immu" Ilmarinen (Vocals, Bass) as Finland's own Lemmy leading this band of rock rebels. Musically Riff Raff sounds like a mix of Saxon, Iron Maiden, Accept, Kiss, Judas Priest, AC/DC and Motorhead. In other words this is more working man's metal than anything else. The music is clean and crisp and the songwriting is some of the best I've ever heard. The songs are crafted like well-rounded classic rock numbers but with a more polished heavy and hard edge. 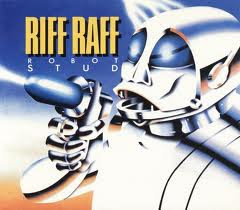 When the number "Robot Stud" comes crashing out of your speakers you know this album is going to be good. Followed up by the band's own "Riff Raff" this album is nothing sort of killer heavy metal thunder. In 1982 this album should have ruled rock airwaves. "Breaking Out" is the best Kiss song that Kiss never wrote while "Fooling with a 44" is Accept morphing their way into Judas Priest. While we are at it the track ("Don't You Think) It's Disgusting" comes off as Accept jamming with Motorhead. There simply is so much to love about this album. Even the cover of "It's All Over Now" (The Valentinos) is fun in a somewhat sleazy kind of way. Every time I listen to this album I catch something new. As I listen to it now I am even reminded somewhat of Rose Tattoo. While it might sound as Riff Raff sounds like too many other acts it all comes off as highly entertaining and enjoyable. Really this is some of the best NWOBHM not too be made by the British! Now, original vinyl copies do pop up on Ebay and while I'd love to have that I settled for the reissued version by Mastervox Records in 2003 with a shuffled track order and two bonus tracks. This version seems to be floating around the net more lately and is pretty easy to find with a simple click or two. Such a shame that Riff Raff doesn't have more of a following. Simply put they are an excellent heavy metal act deserving of more love. The next time your looking for "Balls To The Wall" heavy metal do yourself a solid and track down Robot Stud. You won't be disappointed!